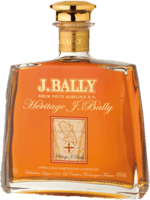 Have you found an online vendor selling J. Bally 12-Year? 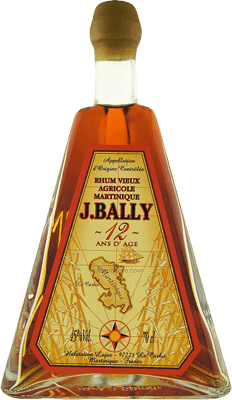 Enjoyed a bottle of J. Bally 12y while vacationing in Martinique. Very nice and unique bottle and label design. Plenty of floral notes followed with grass, pear and oak to your nose and palate. Strong but extremely short burn at the end. Rhum Agricole lovers can easily add 2 points to my score. I dont remember this one so i guess its nothing special. Peach and pear, with grassy (almost malty!) notes in support. A good kick of brown sugar and black pepper. Well-aged rhum agricole from Martinique's J.Bally, presented in their distinctive pyramid-shaped bottle. We wonder if the reasoning behind the shape is similar to those teabags that are pyramid shaped...? Pur și foarte dur. Probabil un rom extraordinar pentru cine apreciază agricol. Not for me.. The bottle is why this rhum earns a place on my shelf. The nose and the taste is alright, but no more. It’s quite sharp but there is nothing else that’s special. Really enjoyable and tasty with a particular and complex aroma, recommended. Aroma: intense, spicy notes, nutmeg and cinnamon. Taste: complex aroma with dominating note of wood. This is a good agricole with 45% alcohol. une très belle version du " classique des caraïbes". Racé mais doux, boisé mais pas Parkerisé. Canelle, épices, cane. Je ne connais pas très bien le reste de la collection, mais celui-ci est un must have. Ottimo regime francese. Sapori forti profumi intensi. Uno dei miei preferiti. Whoom ... this one smells intensive and tasty with a spicy aroma and sandalwood at first nosing. Then there are notes of toffee and caramel, oranges, prunes and plum butter. It is slightly herbal as well. After some time the aroma has changed and is dominated by notes of tobacco, smoke and ashes. Hot and spicy at first mouthfeel, dominated by notes of cardamon and black pepper. Tastes like toffee and caramel, sandalwood, tobacco and licorice with a dash of orange juice. Long, spicy and dry on notes of black pepper and licorice. Slightly herbal and bitter. A 12 year-old agricole? Sign me up! I loved the nose. But the rum itself is just too sharp. It holds onto its agricole brine just a bit too much. And despite enjoying this slowly over the course of an hour, and it still didn't fully mellow or open up additional flavors not present at the beginning. This "Pyramide" is recommended, if you find a good deal for it. Mycket bra vardags rom som smakar i min mening mycket vanilj . I am partial to french style rhums, but even so, this is definitely one of the better I've tried. Added proof give it a strong taste profile, with herbal and buttery tones dominating, as in all agricoles. Excellent stuff! un bon rhum assez goûtu mais aussi assez fort malgré ses 45 degrés.